"Tia Simpson shares affection with Collin, her newly adopted 22-month-old son from Haiti, at her Lehi home, Wednesday, Feb.17, 2010. Simpson is one of a small number of families in Utah County that have recently adopted children from Haiti following the tragic earthquake." We don't have much breaking or spot news in Utah County; rarely ever of the grief stricken. I am not complaining - it's safe and not much tragic happens (comparing to Baltimore); which is a small positive in the world. So in terms of images, it's tough to "compete" with my peers when it comes to newsworthy, emotional and touching photographs that tend to tell a complete, memorable story. The above are from daily assignments, wild art, small feature stories, portraits, and the one of no more than three spot or breaking news assignments I covered in 2010 in an eight month period of time. Since a lot of news is light in our coverage area, I feature hunt and shoot standalones usually multiple times a week, which makes me rely on what I think is one of my biggest strengths - my vivid, colorful and fresh perspective, which as Strazzante said better than I could, "images that rely more on composition and color than on a specific moment." In addition, I'd also add light and subject to that list. But I had a talk with an editor earlier this year about that word - moment. Maybe it's the newspaper way of defining a moment, but I'd fight to the end that every image above is indeed a moment. Of the above, my favorite story was getting the chance to shoot the adoption of Haitian children with two separate families. The story was compelling, relevant, both families were very open and I was able to spend a day with each. I wish I could have spent more time with them - possibly following them from Haiti or another day - alas we run a tight ship in the photo department. I almost forgot about shooting Holi - which was a colorful playground. Otherwise, I feel like I spent a lot of time telling the stories of those that live in the southern part of the county which offers a western, cowboy, farmer type of lifestyle that I find utterly fascinating. So without further adieu, here are my favorite features, portraits and news from 2010. "BYU takes the field against the University of Utah before an NCAA college football game, Saturday, Nov. 27, 2010, at Rice-Eccles Stadium in Salt Lake City, Utah. University of Utah defeated BYU, 17-16." Every year there is college football war in Utah known as the Holy War. This quote on quote "Holy War" pits two of the best NCAA college football teams in the state against one another - BYU Vs. University of Utah. There is a lot of history dating back between this annual game, but I've only been around for the past two years. Last year, an overtime score led BYU to a upset over Utah. This year, the game was much the same sea-saw type of battle. It appeared as if BYU would march down the field to win with the kicking of a field goal. But as time expired, Utah rushed around the defensive line to block the kick, steal possession and seal the victory by one point. It was a crazy ending to a fairly non-visual game. Unlike the other papers and outlets covering the game, most of which had at least three shooters and an editor, I was there holding my own. I was happy with my take and I am glad. Unfortunately, my 2010 shooting season came to end when I was rushed to the emergency room in Utah on Sunday night after somehow reinjuring my back, most likely shooting the football game. I've since had spinal surgery in Baltimore, Md., and running a wordy blog titled "Back Focusing" over on another site here about my operation and recovery. And as always, iPhone pictures on my Modern Cliche blog. This blog will continue to be updated with archives and other posts though. Here is to a healthy recovery and one hell of return in 2011. 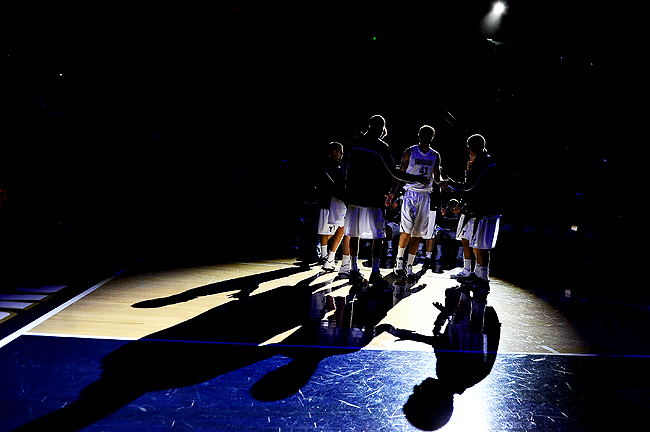 "Brigham Young's Chris Collinsworth (41) is announced before taking on Chicago State in an NCAA basketball game at the Marriott Center, Saturday, Nov. 20, 2010, in Provo, Utah. BYU won 109-60." I have some sort of fascination with team introductions, especially the home team. When I played sports I always got that warm, fuzzy feeling when my name would be called in the starting lineup. Although there were no lights, fog or high-energy music, simply having my name echoed in the entire stadium was speical. That's why I am probably attracted to the pre-game productions. Maybe I wish I was one of those athletes running through the fog and dramatic lighting. "Brigham Young Cougars wide receiver Luke Ashworth (29) tries to pull in a pass against the University of Utah in the third quarter during an NCAA college football game, Saturday, Nov. 27, 2010, at Rice-Eccles Stadium in Salt Lake City, Utah. 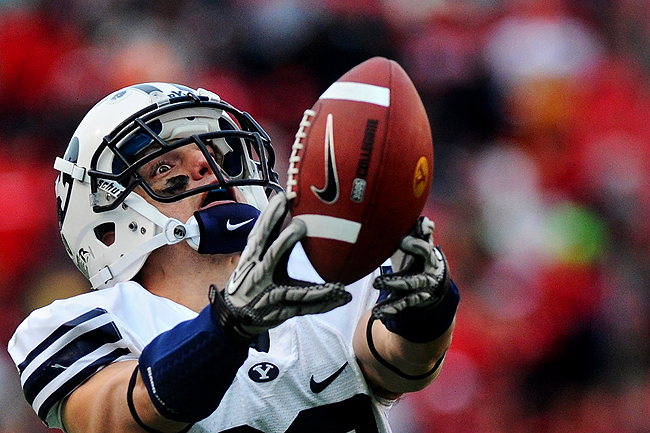 Ashworth dropped the pass and the University of Utah defeated BYU, 17-16." A lot going on in my life right now. I didn't think I'd be able to sneak in a football game upon my return to work following a two month absence due to a serious back injury - but I did. My return to shooting lasted about 12 days and now I am back on the IR as I am penciled in for surgery on Monday. More from the "Holy War" otherwise known as the Brigham Young Vs. University of Utah rivalry when I find a chance.